I think the binding is the most important part of the quilt. If you can get the binding to lay flat and the corners square it makes all the difference. 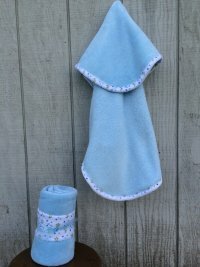 I have figured out a few tricks that I think will help you make your quilt look just like you want. Lets start with cutting the strips. When working with the Minkee Cuddle fabrics I like to use 2" strips cut the width of fabric. I recommend using a walking foot and a 1/2" seam allowance. 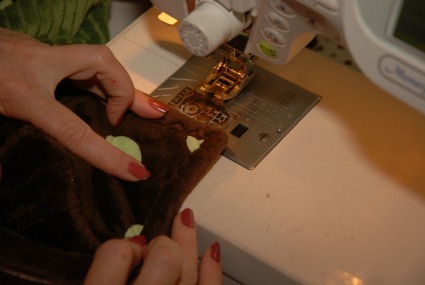 When sewing with Minkee or Cuddle it is important to use a Schmitz size 90 stretch needle. It seems to handle the tight knit as well as the weight. I also lengthen my stitch length to 3.5. 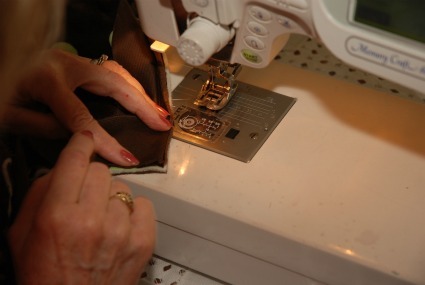 Depending on your machine, you may need to "gently guide" the fabrics through. Don't pull to hard, but a little support is helpful. 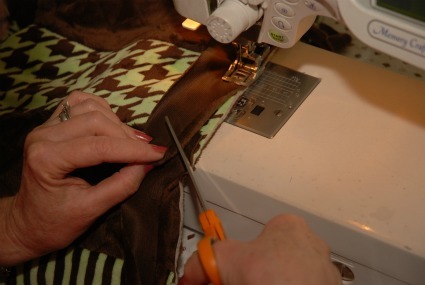 When sewing the strips together it is important to make sure that the nap is going the same direction on your binding. The nap actually changes colors in the light so it always looks nicer if the nap is all going the same. Place your strips so the nap is the same. I like to use a diagonal seam to join the strips. 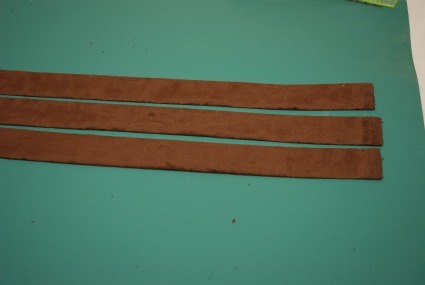 Lay your two strips right sides together as shown just overlapping the selvage edge. 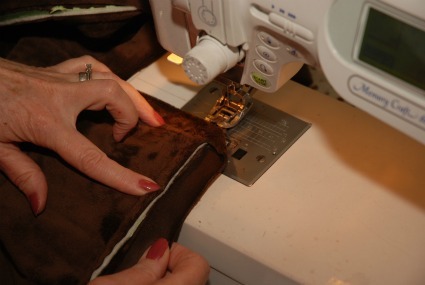 Sew diagonally from the top left corner down to the right bottom corner. 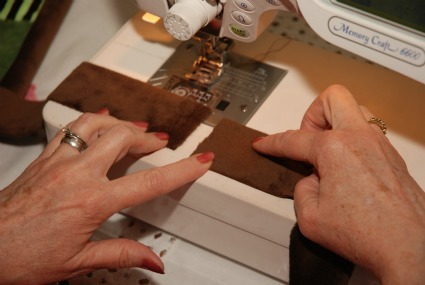 Trim your edge so you have a 1/4" seam allowance. Trim off the extra points so you don't have any extra bulk. Open your strip and it should lay nice and flat. 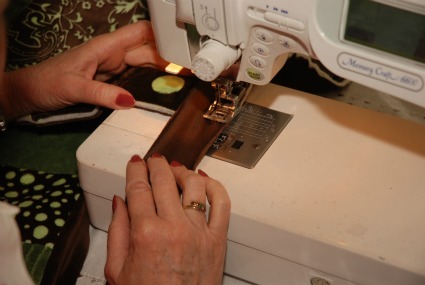 Now you can begin sewing on your binding. I like to use a full 1/2" seam. I like to sew the binding on the front of the quilt so it wraps to the back. You can hide more mistakes that way. The front needs that nice straight edge. I like to place the binding strip so that the nap wraps around the quilt to the back. It just feels better that way. Start the binding about half way into the quilt. I don't like it when the binding seams land on the corners. When you start sewing, leave about a 4" tail. This is where you will join the strip when you come back around. Now, you've come to the corner. That's the part everybody is afraid of. It really isn't that hard one step at a time. 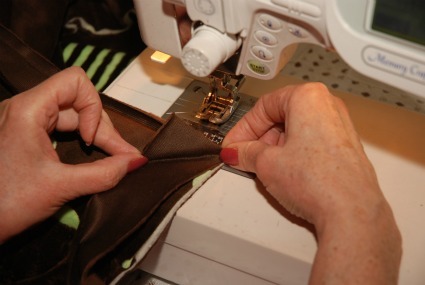 You are sewing down the edge using a 1/2" seam allowance. As you come to the end, stop 1/2" from the end. Lift your needle out and turn the quilt to the next side. Pick up your binding strip and fold a miter corner. Fold it so that the top fold is exactly even with the top outside edge. Your outside folded edge and point should also be square and right on the top corner of the quilt. This fold is what forms the square miter on the binding. If you need to, put in a few pins to hold your angle in place. 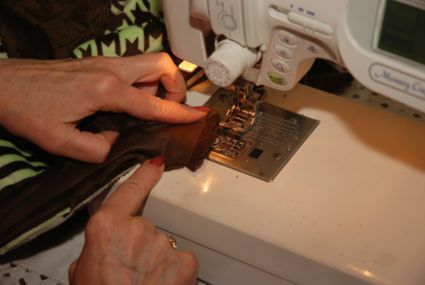 With the fold in place you are going to begin sewing on the top outside edge. 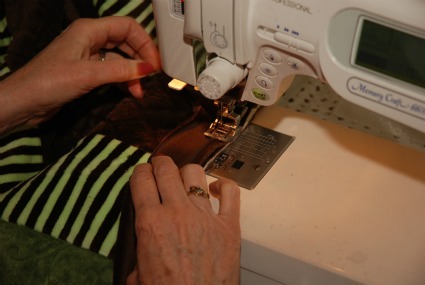 Using the 1/2" seam allowance sew through all layers and continue down the next side. As you look at your corner and fold back the miter, it will fold over the back and give you the perfect corner. Now that you've made it around the corners here is how to finish that binding. This was the part that always puzzled me. I could never make the seams all look the same. It really isn't very hard. 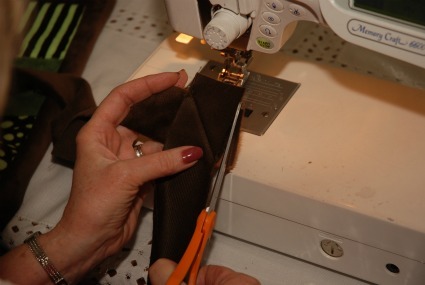 Remember when we started sewing on the binding we left about a 3" tail. As you come to that starting point stop about 6" away. Overlap the two ends, and leaving a 1/2" seam allowance on both ends cut a 45 degree angle in both the top and bottom strip. Line up your strips and using a 3/8" -1/2" seam allowance sew your seam. 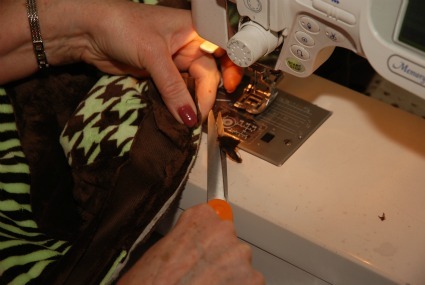 Now your ready to finish sewing on your binding. You may need to adjust you seam allowance. 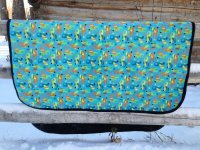 This fabric is a little stretchy and you want your binding to fit smoothly. You may need to take a little bigger or smaller seam to adjust for that. 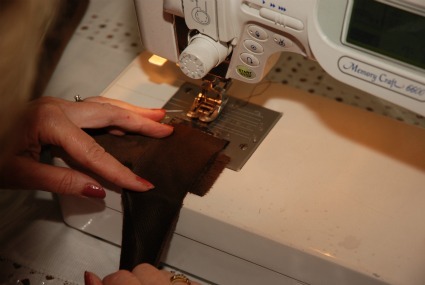 Finish sewing on your binding. I like to trim off the bulk in the seam of the binding. 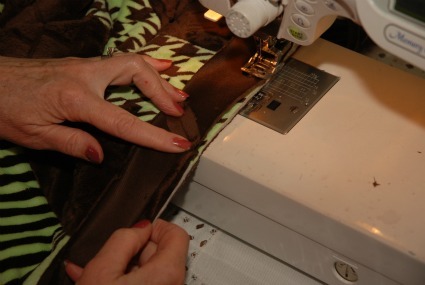 You are folding that binding four layers thick so it is a good idea to just trim out the bulk where the seams are. It makes it lay a lot flatter. I also like to trim off the tips on the outside edge as well. 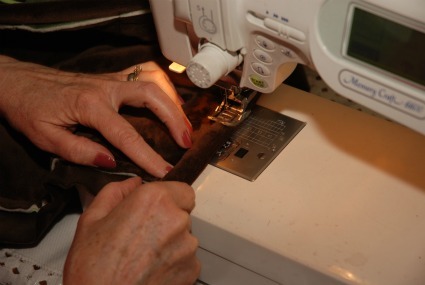 Now were going to sew down the binding. I like the binding to fit tight against the batting edge. just fold the binding around and fold under the excess fabric. You should be folding under about 3/8". 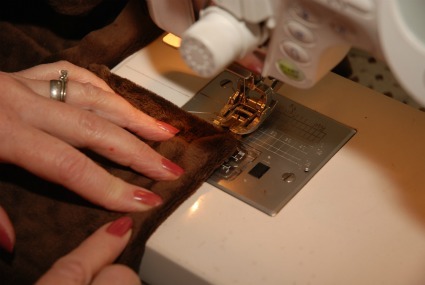 Using the serpentine stitch or other decorative stitch top stitch down your binding. If you keep the folded edge right on the outside of the stitching line your top-stitching will be just inside the binding on the right side. 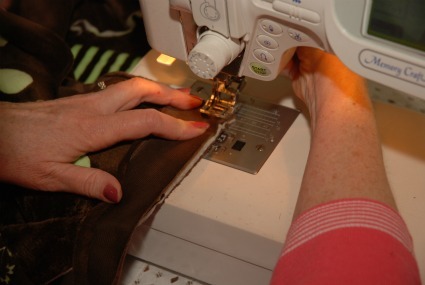 As you top stitch the binding down you are sewing through 4 layers plus the quilt. Depending on how you can adjust your machine I like to loosen the pressure. It make the quilt go through a little easier. I also gently "Guide" the quilt through. If you pull to hard your stitches aren't even, but I do help the quilt through. Don't be afraid of pulling just a little. The next big challenge is that corner again. I discovered that the trick to the square corner is making sure that the corner of the quilt is poked right into the folded corner of the binding. I sew almost to the end of the quilt so that the fold is secure. As you do that, keep your edges folded under and flat and if that end is tight into the fold you get a nice square corner. I like to finish the corner by starting the next side by stitching just above the fold. If you are careful you can manipulate the fold so you get a great corner. Congratulations, you have just master the binding. This same technique works on any kind of quilt. 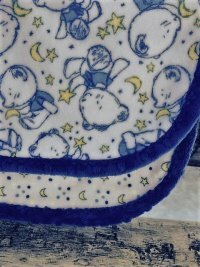 Of course with cottons you would use a double folded binding where with the cuddle you just use one layer.